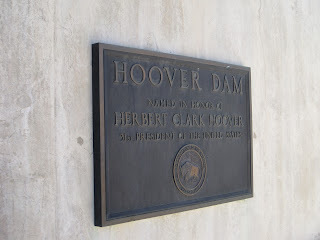 Hoover Dam, one of the Seven Wonders of the Industrial World, is named after Herbert Hoover, the President of the United States. It is situated on the border between US states of Arizona and Nevada, in the Black Canyon of the Colorado river. It was the 25th Christmas morning. 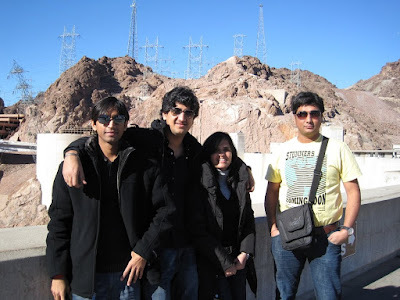 We had our junction point at Las Vegas, where we stayed. 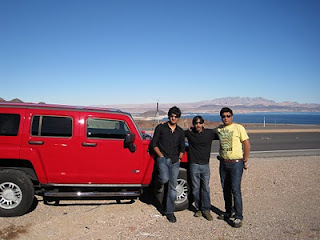 We 5 [Hum Paanch - Four friends along-with our Hummer humsafar] departed from Las Vegas to Grand Canyon. Hoover Dam was our first official stop. It is approx 50 Km away from Las Vegas. Due to scenic beauty, We have to stop our Hummer at various points as well. It was a pretty sunny day, more than expectation, as during December clouds and rain don't leave you away. But still it was damn cold outside. 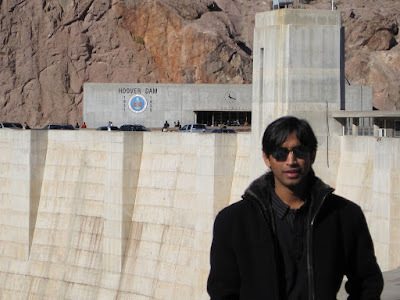 After placing our hummer at ambiguous parking slot, we walked around the Hoover Dam. We spare some moments at various cam click places. There is another bridge construction going on over the dam as well. 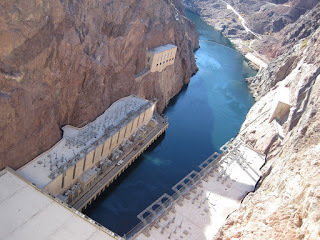 The downstream view from the Hoover Dam, shows the colorado river, power stations and power lines. I would say, Guided tour wouldn't be preferable here unless you are more interested in deep history and its construction. There is an exhibit, food stuff at the dam as well. At the time of its completion in 1936, It was both the world's largest hydroelectric power generating station and the world's largest concrete structure. The power distribution is allocated to US states of California, Nevada and Arizona. There were many helicopters flying above our head at time to time. 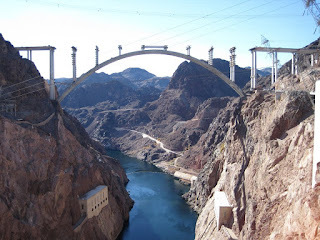 As people used to have helicopter tour over the Hoover Dam. (Sometimes combined with Grand Canyon Helicopter tour). Now it was time to approach towards our final destination of the day - Grand Canyon West Rim.